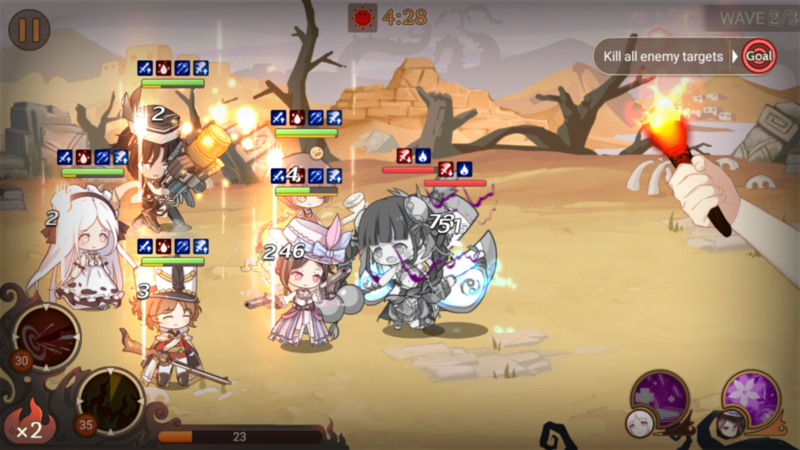 With the current devices, it’s easier to play some heavier games on your phone. Elex, known from games like Clash of Kings and Love Nikki, is here to bring you a new type of fantasy. A lot of people daydream about food and the visions are going to become reality. Are you ready to dive into this delicious world? We’re teleported to the world of Tierra, where you are a Master Attendant. This is a rather important title and responsibility as you have Food Souls at your disposal. These entities are all yummy types of food, but visualized in a different way. Instead of actual food, they’re anime-like characters. You have to take up arms against the Fallen Angels as they want to wreak havoc in the world. 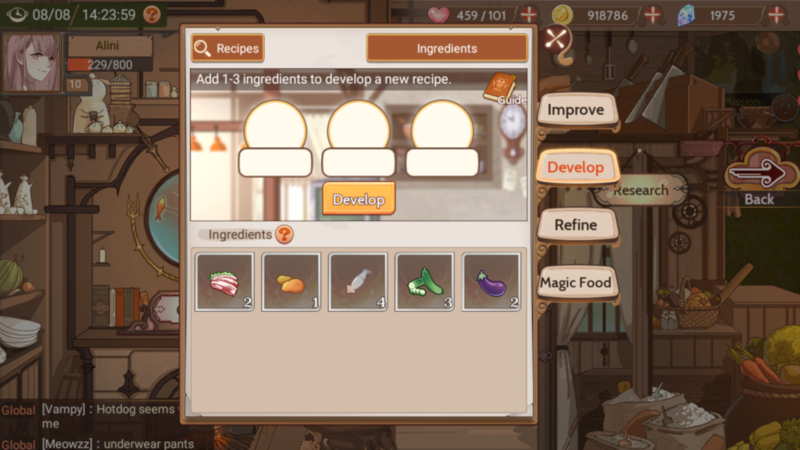 In the meanwhile, you also need to run a restaurant, do deliveries and get ingredients from nearby locations while fighting bad guys so you can create new recipes or make your already learned dishes. There are a lot of elements to take into account and there is a main storyline together with a variety of side quests. In the end, there is enough content to keep you satisfied for a while, especially when you’re looking for something special. As you’re thrown into an anime-like world, you can only expect cute and colorful characters. Elex didn’t disappoint, as everything looks so detailed and beautifully drawn. The main screen has the overview of the world with lots of info on it. This might look a bit overwhelming, but every icon, timer or any other element is well-placed. The restaurant and fighting screen both have their specific characteristics, totally different from the rest of the game but it blends in so well. Upon entering your establishment, you are greeted by the cutest characters, which make you forget you got to fight. When you do engage in battle, you get to see a different side of your party. Each of them has their own chibi version and forcefully attacks the enemy. It’s easy to recognize the bad guys thanks to this 2D system and their rather aggressive manner and size. 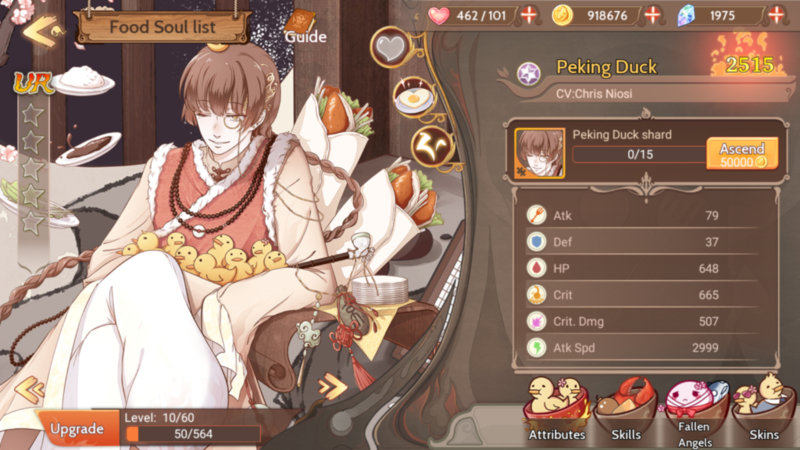 If you’re looking for music, Food Fantasy has some fun tracks to soothe your soul, fitting with the setting completely. No beats or other adrenaline-pumping music but tunes you can expect when you turn on your favorite girly anime. As this is a mobile game, there are only a limited amount of tracks available so it might be that some of them sound familiar rather fast. Of course, sound effects are present as well and emphasize the anime-like character of the game, but Elex mostly boasts the fully voiced Food Souls. When you summon a new spirit to join your ranks, you are treated by a nicely voiced text, while they also talk after a fight. This voice acting is really well done and it gives you more immersion in the game, although you might hear the same lines being repeated a bit too much at certain times. Food Fantasy is an JRPG and combines a variety of elements. 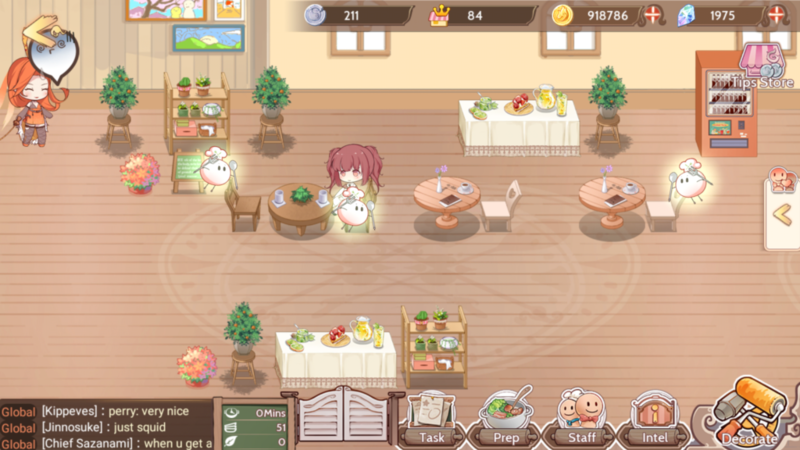 For example, next to the 2D fighting and RPG elements, you also have to manage your own restaurant. The combination of all these aspects makes it a rather packed game and you might be a bit taken aback at the start as a lot of information is thrown at you. At least there are a lot of guides that will explain certain parts of the game and a lot of the side-quests are partially tutorials too. As the game has so much to offer, it’s rather hard to tackle every aspect. First of all, you have to make a party of Food Souls, which are summoned by you. To do so, you need to have Soul Embers, which can be obtained by completing main and side quests for example. You can swap Food Souls to your liking, especially as some types of food tend to work better together and emphasize each other’s attacks. This is a really important aspect, as it can make or break a battle. Of course, Food Souls are rated so sometimes you’re able to summon an UR or ultra-rare companion. You’re able to level every Soul by fighting or using items, upgrading their attacks or even giving them a different outfit. You can also make them ascend, which makes their stats rise a lot thus making them a lot more powerful and useful during battle. To do so, you need an amount of coins and enough shards of that specific Soul. Fighting is quite special as well. You have five members on the field and some enemies to fight. If you’re facing a big monster, you will probably have to block a massive attack now and then. You can recognize this by the counter on several parts of the body, which you need to click before time is depleted. This doesn’t always work though, but it’s best to try and interrupt or weaken the attack. Sometimes there are smaller enemies who keep healing and this is where you come in. You can flick them of the screen, which is rather fun to do and makes you feel a lot more immersed. Even more, you have two skills of your own, which even shows your hand on the screen. It’s really funny to see this pop up, so don’t drink while fighting. After your hard battles, you can turn back to your restaurant and sow the hard labor. You need to populate your kitchen and dining area and after a period of time, these Food Souls are tired and are in need of replacement. You can make several dishes, depending on the research you’ve performed, which will need some time to make of course. In the meanwhile, it could be you need to fend of some annoying customers which will lead to you fighting in your own restaurant, the nerve! When you reach level 10, you can start decorating the place while you can also expand your capacity and so on. After a while, the delivery option also becomes available. Here, you need to send a second team with a certain delivery to that client, which will give you some nice loot as well. Just like in most apps, there are several currencies for you to obtain. Some of them are gotten by just playing the game, like coins, while others need to be bought ad can be used for special in-game purchases. Also, you have a certain amount of energy you can use for certain activities, so it might mean you need to wait a bit sometimes until your points are restored again. 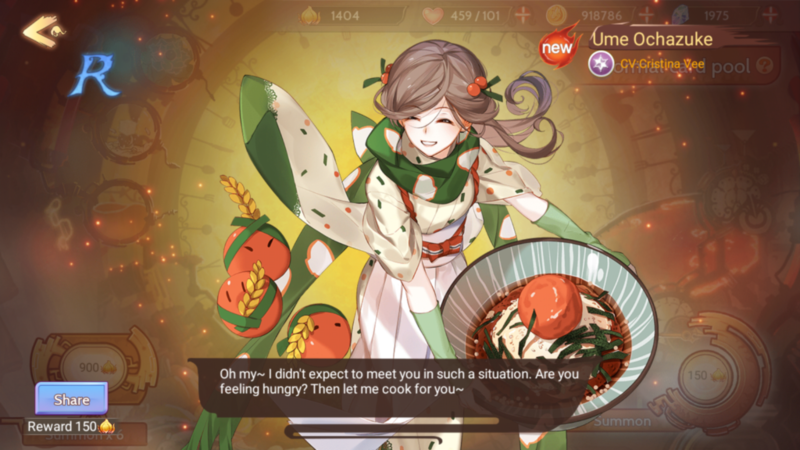 If you’re looking for a fun and free game to play on your phone and you’re looking for a special JPRG, it might be an idea to check Food Fantasy. The game has a lot more to offer but it would be too extensive to get into detail in this review. Story wise, it’s a refreshing wind and the graphics are surely going to charm you, just like the voices. Gameplay wise, there is a lot to take in but if you press through, you’ll be able to enjoy a rich and extensive game.